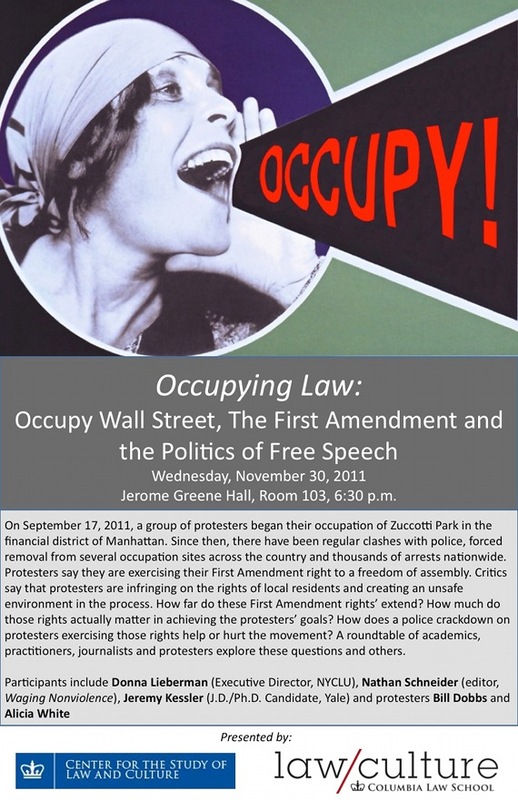 If you’re in New York this coming Wednesday, we hope you’ll consider joining WNV editor Nathan Schneider and contributor Jeremy Kessler for a panel discussion about the First Amendment issues raised by the Occupy movement. Get in on Facebook here. Wish I were in NYC and could sit in on this. Is this streaming anywhere? Sounds interesting. Wish you could’ve added someone on the panel who takes a different view of the matter. Would make for a fuller discussion. Agreed—diversity definitely seems like it might be lacking on the panel in a serious way. I will try to represent some of the city’s at least public rhetorical arguments—though not with much sophistication or credulity, I fear. Will this discussion be posted online/YouTube? Not sure. If they don’t, I’ll try to remember to bring a recorder, and perhaps I can at least get audio.